At Elephant, we believe that design is ever-changing. Having been in the market for a while already, Chunkies had received a great response. But it was time for a change. Britannia was looking to revamp the existing packaging to make the cookies stand out on shelves, positioning it in the super premium segment. We were brought in to contemporaries the packs for the new varieties of Chunkies Cookies. The earlier brown pack colour had become very standard and wasn’t exciting to look at anymore. Our team decided to revisit the muted shade and introduced an element of colour with bright, eye-catching gradients for the pack background. The different colours were also used as differentiators for the newly introduced variants. This lent a sleek and premium look to the boxes, making them stand out from the competition. The previous packaging seemed too cluttered, and was taking away from highlighting the product. We worked on cleaning up the pack, doing away with elements which did not add any value. We decided to stick with the chalkboard treatment used for the earlier pack, since it had become an identifying element and was associated with the brand. 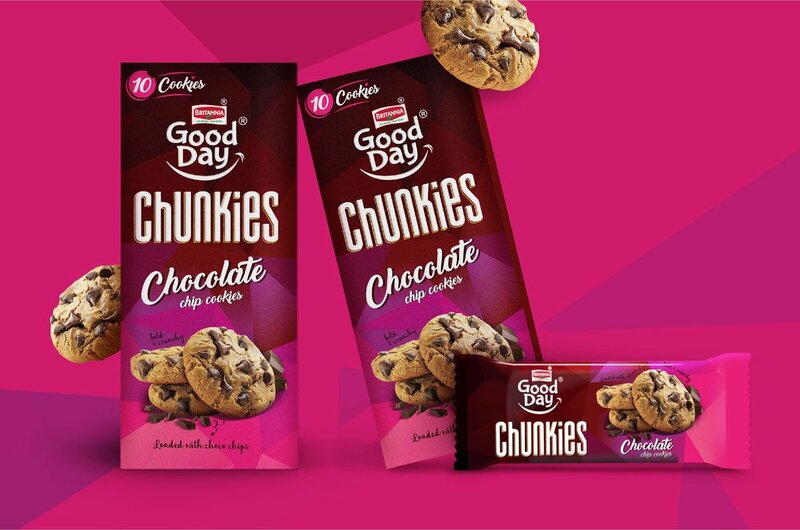 Since the launch of Chunkies’ new packaging, it has been received well by consumers. The variants have been able to stand out on the shelves, setting them apart from similar products.